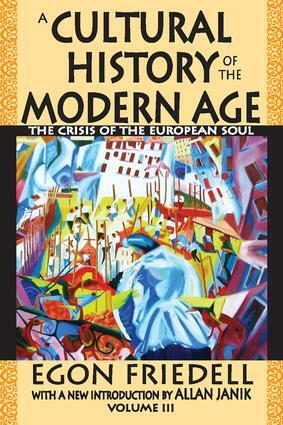 Volume three of A Cultural History of the Modern Age finishes a journey that begins with Descartes in the first volume and ends with Freud and the psychoanalytical movement in the third volume. Friedell describes the contents of these books as a series of performances, starting with the birth of the man of the Modern Age, followed by flowering of this epoch, and concludes with the death of the Modern Age. This huge landscape provides an intertwining of the material and the cultural, the civil and the military, from the high points of creative flowering in Europe to death and emptiness. The themes convey multiple messages: romanticism and liberalism opens the cultural scene, encased in a movement from The Congress of Vienna and its claims of peaceful co-existence to the Franco-German War. The final segment covers the period from Bismarck's generation to World War I. In each instance, the quotidian life of struggle, racial, religious, and social class is seen through the lens of the mighty figures of the period. The works of the period's great figures are shown in the new light of the human search for symbolism, the search for superman, the rise of individualism and decline of history as a source for knowledge. This third volume is painted in dark colors, a foreboding of the world that was to come, of political extremes, and intellectual exaggerations. The author looks forward to a postmodern Europe in which there is a faint glean of light from the other side. What actually appeared was the glare of Nazism and Communism, each claiming the future.